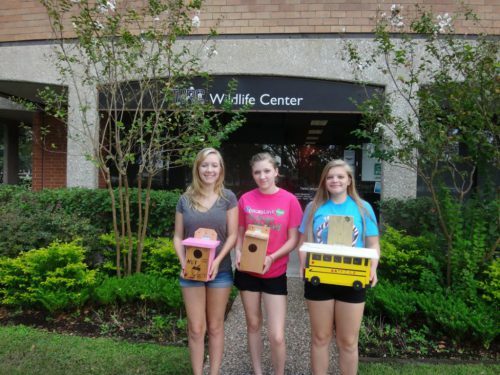 TWRC Wildlife Center welcomes participation from Boy Scouts, Girl Scouts, Church groups, Business groups and other organizations interested in serving their community by helping our local wildlife through TWRC Wildlife Center. People interested in performing service project work for TWRC are not required to attend volunteer orientation sessions. Typical service projects include building rehabilitation cages for birds and mammals, constructing nesting boxes for recovering wildlife, making educational presentations for schools, and holding collection drives for items on our wish list. Other projects also include various sewing projects like animal pouches, aquaria liners, cover cloths, tail guards, mesh boxes, and projects that require an artistic skill such as thank you cards, awareness posters and brochures. We average four Eagle Scout Service Projects each month, and several Girl Scout Silver and Gold Awards. Project selection, scheduling and assignment must be coordinated with TWRC Wildlife Center Scout Liaisons. Every effort is made to match your needs and capabilities with a project that can be successfully completed. Please keep in mind that our needs are seasonal and that we might not be able to assign a project during our Low Season when our needs are minimal. For young scouts that want a service project, contact the Girl Scout Liaison or Boy Scout Liaison for more details. For other groups or businesses wanting a service project for your group, please email the Center Coordinator. There are several options to accommodate your requirements but keep in mind that our needs are seasonal. During the Low Season, we have few needs for our wildlife as our admissions are low during this time of year.